Well, plan B it is. We had snow, ice, more snow, more ice and now...yes, out my window I hear it sleeting again. UGGGGGGGGGGGGGGGGGGG! I hate winter! There is suppose to be 6-9 inches of snow along my route to the Quilt Festival, which is a four hour drive. Needless to say, this little bunny is staying home. I just don't know how to drive in snow and I don't want to hurt myself, somebunny else or my bunny mobile for that matter. If I lived somewhere that there was snow all the time, of course I would learn. But I don't and this isn't the time to try and figure it out. So home it is. Waaaaaaaaaa! Oh well, I will get a lot of work done that needs to be done. 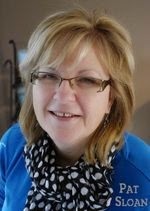 So, since I can't share photos of the Mid Atlantic Quilt Festival with you, I will share this cool article on QuiltCon. Have you heard of QuiltCon? It's all about modern quilting and modern quilters. This article came from Houzz (with permission to embed). 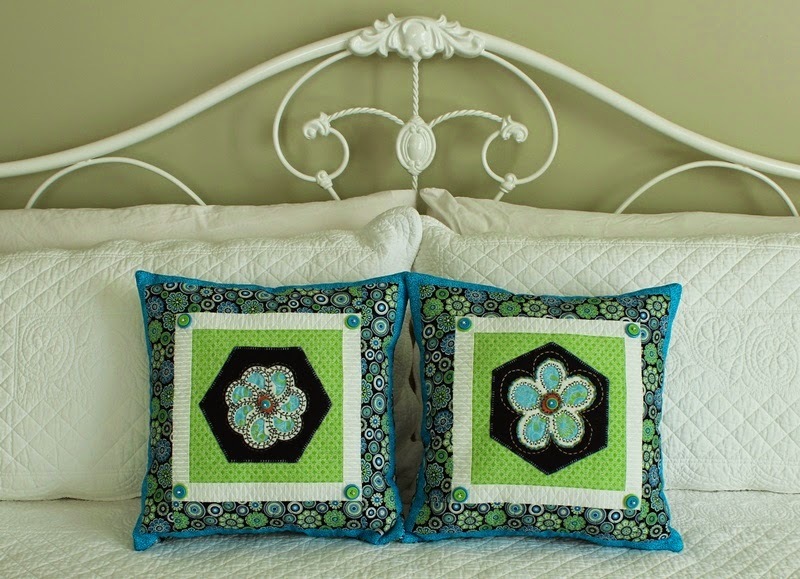 So what do you think of modern quilts? Have you made any? Keep warm, do something creative and have a fun weekend. I just had to share this art quilt with you. It is made by textile artist, Joy Pitts of Nottingham UK. You know why I was drawn to it when Pat Sloan talked about it on Facebook. Hee,hee,hee. 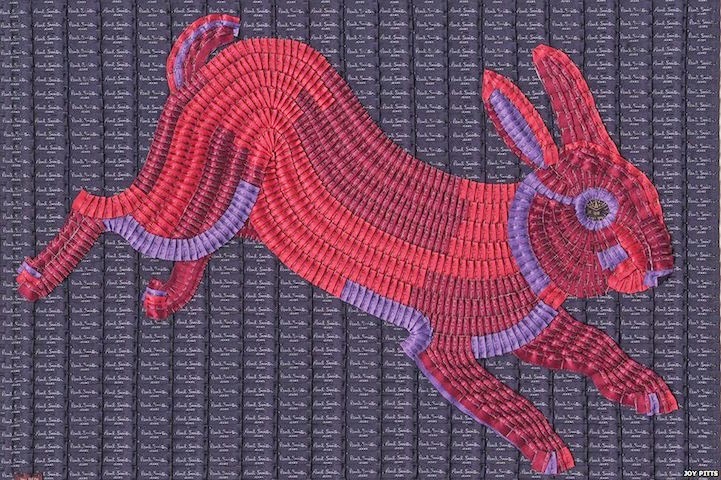 Joy was commissioned by designer Paul Smith to use labels from his jeans to create a piece. There are over 2000 labels in this! I loved this article and I think you will too. Hop over HERE to read more. Well, keep your bunny ears crossed that we don't get snow and ice later this week. I am suppose to be leaving on Thursday morning for the Mid Atlantic Quilt Festival in Hampton, VA. This is the festival I go to every year. 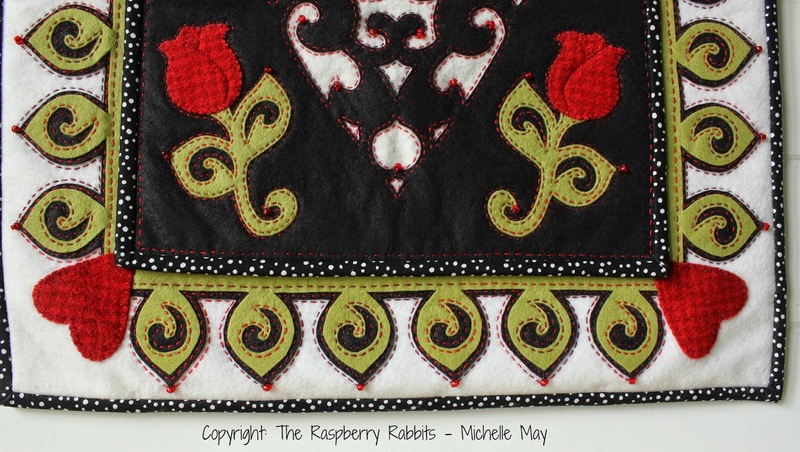 I will be meeting up with my dear friend, Shannon Shirley of Once in a Rabbit Moon. She and her Mom attend the show every year too. Shannon also has a display at the show! I will be sure and take lots of photos to share with you. 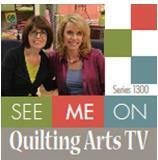 In addition to drooling over all the wonderful quilts on display, I will also be taking a class from Debra Konchinsky! I'm so excited! I have loved her pieces every year at the show. 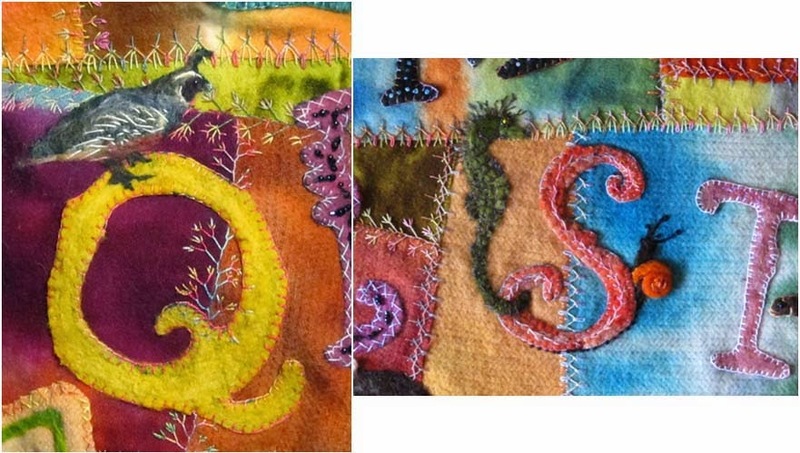 The class I'm taking is called "Felted Applique Alphabet in Wool." It involves needle felting wool roving. This is something I have seen in videos, but I find it a lot more fun to take a class with creative friends. I love learning and I think taking classes from others makes me a better instructor. It's going to be a great time and I will be sure and show you what I make. Well stay warm and do something creative. See ya back here on Thursday. At least I'm working on something which helps me focus on Spring. Here is a sneaky peeky of March's Blessing. Can you guess what it is? I only have 2 complete kits left for February's Blessing. I won't be making up any more of these for a few months so if you want one of the last two, hop over to my SHOP and get it. So the other night, we had an ice storm. I could hear the ice slapping the windows and the wind was howling. All I kept thinking about was how grateful I was that Sabrina kitty lives with me and wasn't outside in the cold with no food or warm shelter. 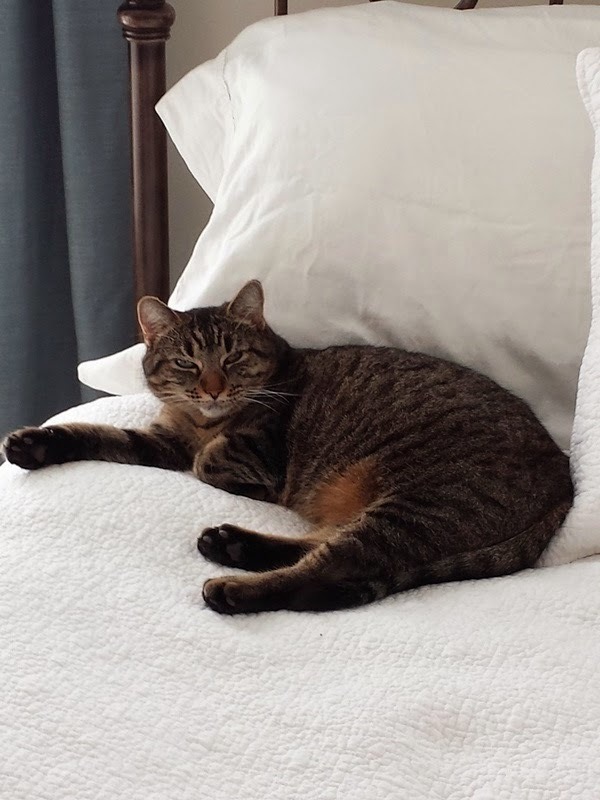 "Yes, I am using your pillow. I really don't see the problem." 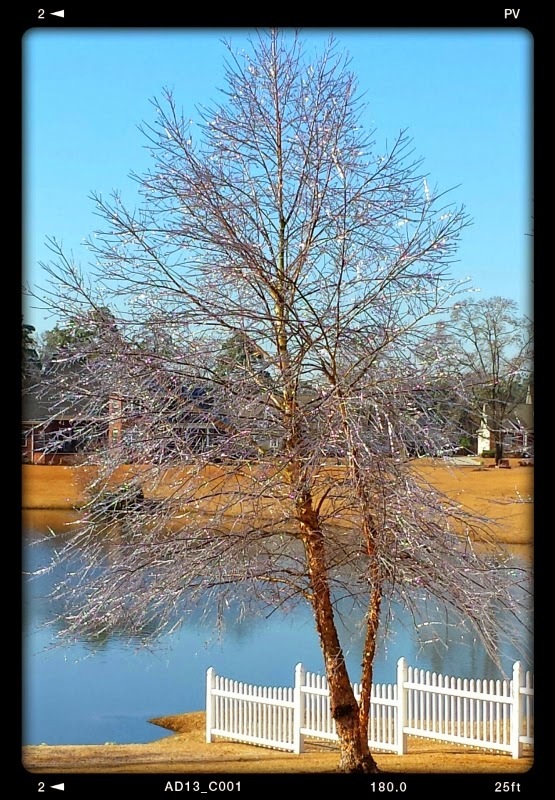 The day after the storm was dark and dreary, but yesterday, the sun came out and started to melt the ice. I looked out my back window at the pond and the trees. It was so magical. I decided to bundle up and head out with my camera. I felt like I was in wonderland when I looked up at the trees topped with ice. It was so beautiful with the sunlight pouring in against the Carolina blue skies. Oh how I love blue skies filled with light. I ventured over to my crab apple tree. The remaining crab apples were little balls of ice. I thought the branches looked like a briar patch. The river birch trees were stunning with their peeling bark and soft branches with ice dripping off of them. I loved how the ice was dripping off the fence too. The colors in this photo gave me an idea for a future quilt palette. I thought it was such a pretty combination. 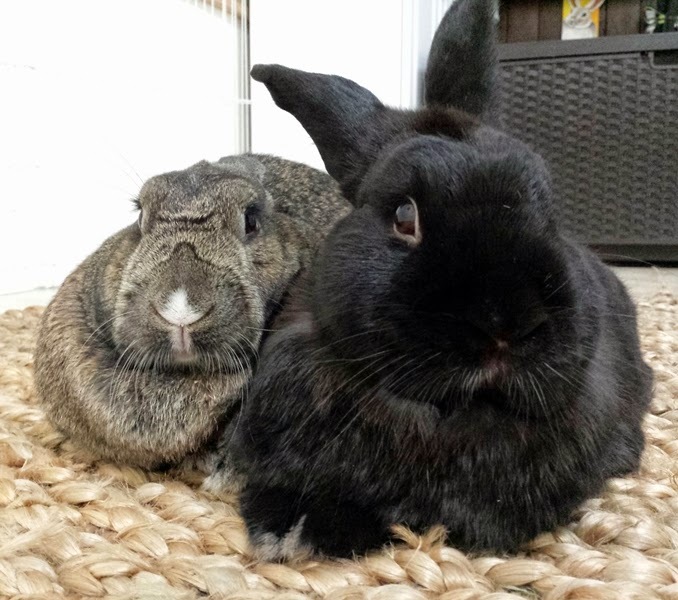 "Just so you know, we're snuggling until Spring. So don't expect any work out of us." I don't blame you bunnies. I don't blame you one bit. Now scoot over and let mama in on that snuggle action. Have a fun weekend. Sending warm and happy wishes your way. Ok, so that was just so much fun! I will admit though, I was nervous. I'm really glad I didn't say anything too dorky. hee,hee,hee. If you were busy with your job, your life, the snow, etc. and missed the interview, you can click HERE and it will take you to the podcast. There are many fun interviews to hear. I have really enjoyed stitching and listening. 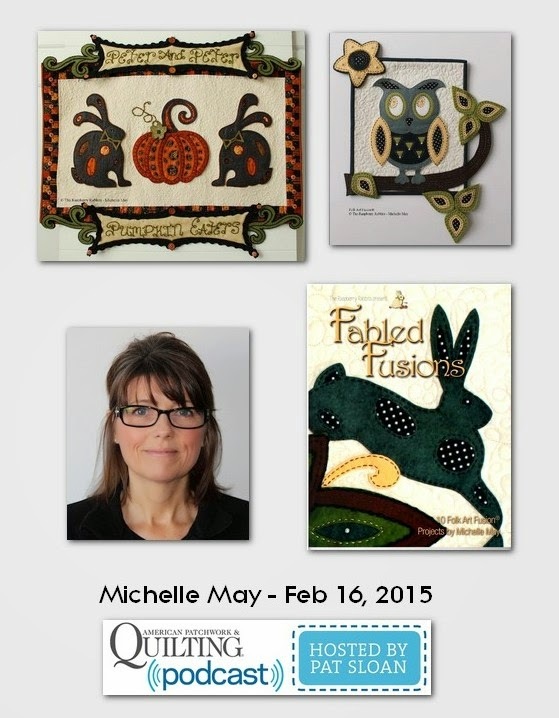 It was truly an honor to be an invited guest among so many talented designers and authors. Pat is such a wonderful person and I admire her and her work tremendously. The Bunnies, Sabrina kitty and I would like to invite you to join us this Monday, February 16, as we are so excited to be a guest of the incredible Pat Sloan on American Patchwork and Quilting Radio! You can listen to us live at 4:00 p.m. by clicking HERE. Hope you can hop by! Well, it's finally finished. I stitched and I stitched and then I stitched some more. As you know I wasn't sure if I was going to "Stitch it or Ditch it!" You encouraged me to continue, so I did even though the color scheme was way outside of my wheelhouse. I present to you my "Love is a Rose." It was inspired by the song written by Neil Young, and sung by Linda Ronstadt. They say, "Love is a rose but you better not pick it. It only grows when it's on the vine." I think that's what true love is all about. The longer it is on the vine the stronger it grows. There may be some thorns along the way, but there is always another day of blooms on the vine. To me this applies to all kinds of love, not just "married" love. There is great love in all things, even the things with thorns. The pattern is available as a PDF download in my Craftsy shop. I also have twelve (only twelve right now) Complete kits available in MY SHOP. The kit contains everything you need to make the project. This is also a Class I am teaching. If you belong to a guild and would like to have me come share a "Play Date" with you, please click on the tab at the top for more information. We have lots of fun and I would truly love to come and meet you! 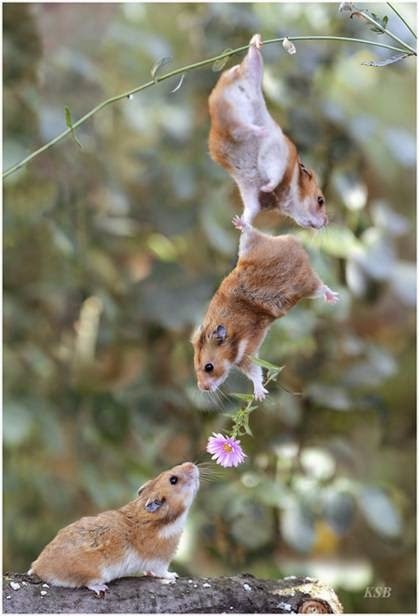 Wishing you a wonderful Valentines Day with those who are most precious to your heart. 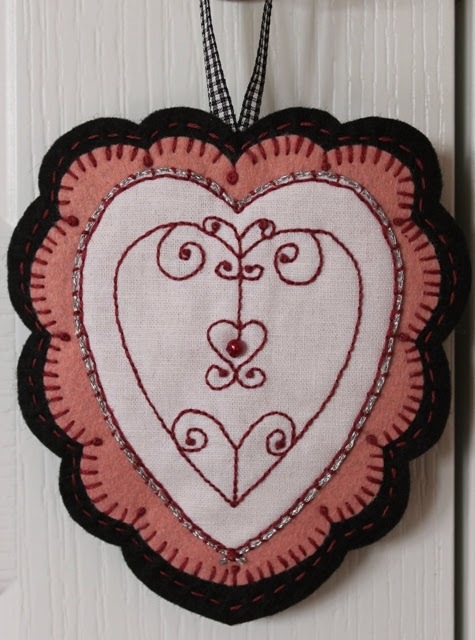 Here's a little free stitchery pattern from us to you with lots of love. Hop over to my Craftsy shop to get it. 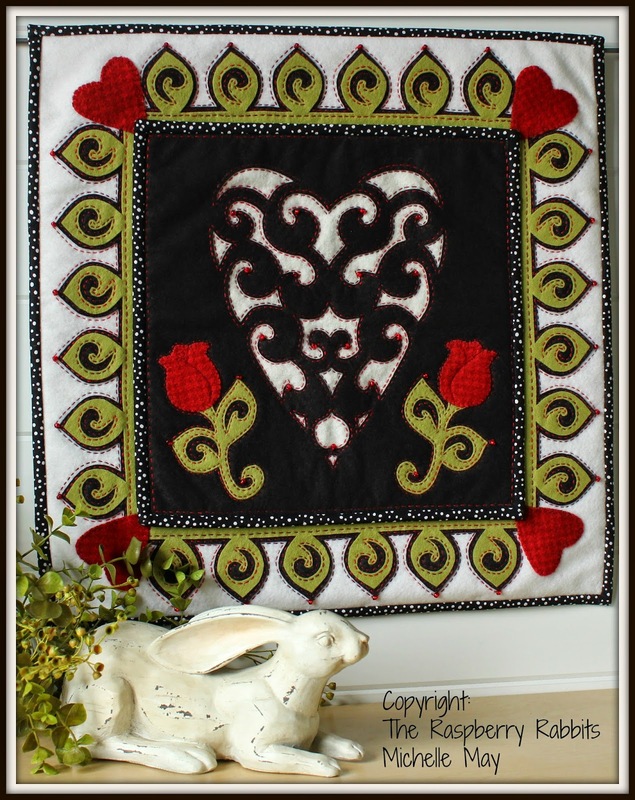 We'll see you back here on Thursday with our new "Love is a Rose" pattern and kit. This will also be a class. Hi ya! First, I want to thank you for your kind emails and excitement for the next blessing. It makes me smile so big that you are looking forward to these patterns and kits. The new blessings will be available on the first Thursday of every month. You can be sure that I checked February's Blessing a million times before I sent it to the printer. So let's hop to it! Here is our February Blessing. This is another one of my favorite Irish Blessings. 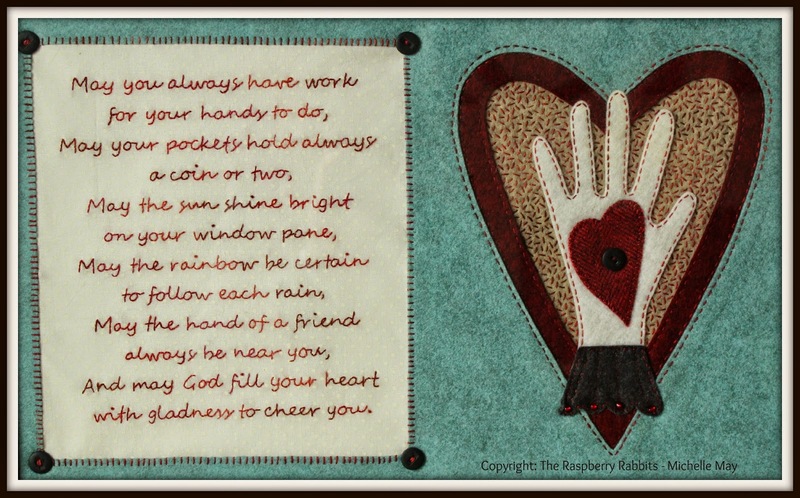 A very special thanks to my wonderful stitching assistant, April Taylor, for stitching the words in the blessing. 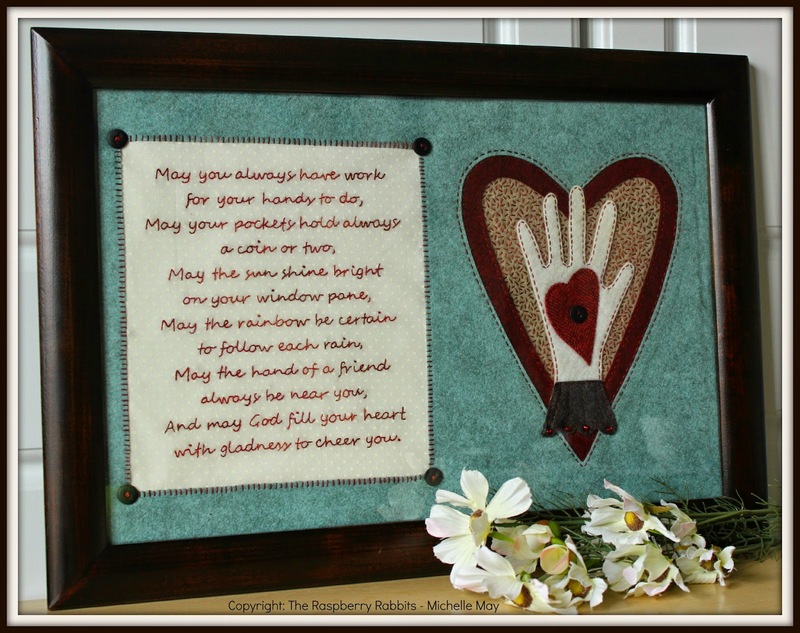 I have always loved the "heart and hand" pattern and I thought it was a perfect fit for this blessing. You can purchase the pattern as a PDF download from my Craftsy shop HERE. I also have a COMPLETE kit, yep, everything you need to make the entire project including the paper pattern, available in my Shop HERE. I only have 24 of these kits available right now so if you would like one don't delay. I sold out the January Blessing kits on the first day. Of course, it's February and love is in the air. 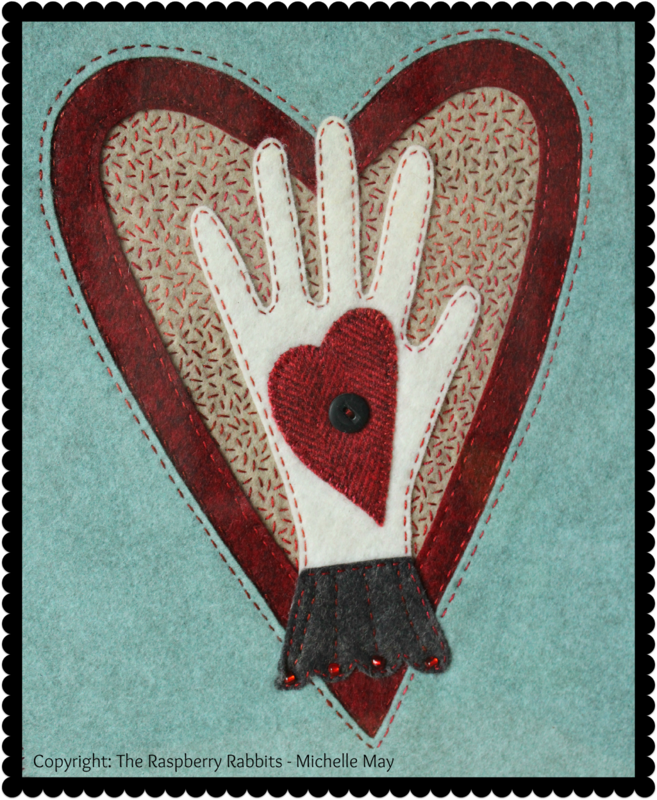 I will have another fun, Folk Art Fusion project and kit available next week (bunny ears crossed). So stay tuned to the blog! Thank you for all your kindness, support and for going out of your way to to extend a hand of friendship. You are truly a blessing to me and the bunnies and Sabrina kitty too! However, things I have made, used and enjoyed are a different story. So, I decided release some of my stuff by having a "D" - Stuff'ing Sale! All of these items are available to first email, first payment, first come basis. Send me an email with the item you would like to add to your stuff and I will send you an invoice through Paypal. The invoice must be paid within 24 hours in order to keep it fair to others. 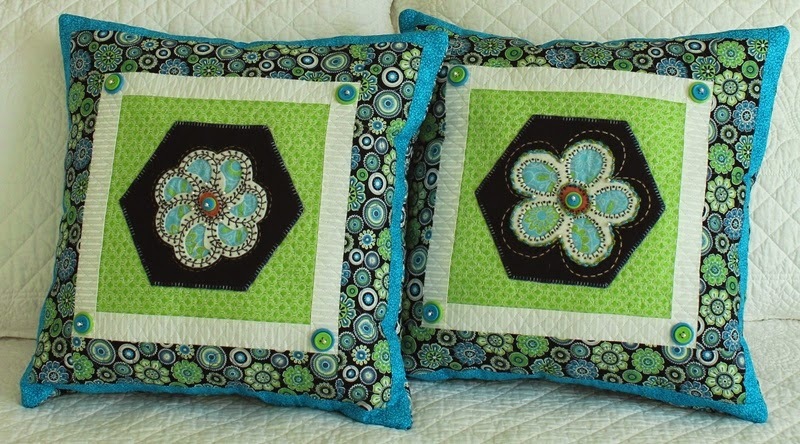 Ok, first up are the two pillows I made for our Fellowship of the Flowers project last year. If you still haven't finished your flowers or pillows, you can cheat and just purchase these. hee,hee,hee. The pair of pillows with shipping in the US is $45. Outside the US is $65. 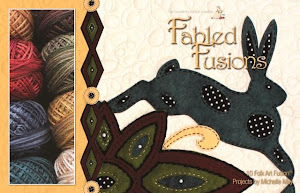 Next are some wonderful books I used for inspiration and for mixed media projects. Each book comes with a CD. The books are in perfect condition as are the CD's. Each book has hundreds of copyright free images to use. There are approximately 57 pages in each book. They were originally $15 each. I am asking $9 each. Shipping will be $6 - $12 US depending on the number of books you would like to purchase. Shipping outside the US will be around $20 - $35. Simply send me the name of the book you would like to add to you bookshelf of stuff. Let me know if you have any questions and pass the word along to your friends. Ok, back to packaging kits for our second Blessing of the Month, which will be available on Thursday. I can't wait to show you.